WASHINGTON — The Turkish government reopened a park that was the center of controversy last month, where demonstrations and protests evolved from protesting the government’s plans for the park to the government’s current policies. Reuters reports that Gezi Park, which had been closed to redo the landscape and replant trees and flowers, was opened until the Turkish government decided to close it. 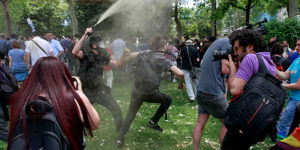 The reason, said the government, was to preserve the park as democracy activists threatened to take over the park again. The possible protest was to defy the city’s governor, Istanbul’s Huseyin Avni Mutlu. Mutlu and his party, led by the current prime minister Tayyip Erdogan, have enacted Islamist policies that have enraged secular Turks. Alcohol advertisements were banned outright and the sales of alcohol were restricted to daytime sales, which upset Turks that were used to buying alcohol at any time of day. Some fear this is a slow and gradual Islamist takeover, which helped spark widespread protests last month. It also does not help that the Turkish government conducted raids on protester’s homes and arrested several of them.